Hair loss can be devastating; sadly, many people believe there's nothing that can be done. Thankfully, that's not the case, and today we take a look at Pura D'Or hair regrowth products. Do they live up to their claims? We find out, and share our unbiased answer at the end of the report. Keep reading! Does it work? More importantly--is it worth the cost? What is Pura D’Or and How Does it Work? Though it’s not something we like to talk about, hair loss affects a huge segment of the population. As much as 50% of women experience it as well as 65% of men by the time they’re 60. It’s common to believe that things, like shampooing or brushing your hair too much or wearing a hat, cause hair loss, while others believe that nothing can prevent hair loss. Thankfully, none of those are true, and today there is a myriad of treatments available for people who are experiencing balding, hair shed, and everything in between. Pura D’Or is one such product. Designed from natural, effective ingredients, the line has an almost cult-like following thanks to its ability to generate new hair growth. We’re diving into the nitty-gritty to help you understand who these products work for, who they won’t help, and whether or not they’re worth the investment. To understand why Pura D’Or might or might not work, however, it’s important to understand why you might be experiencing hair shed or thinning. We’ve already mentioned that a huge percent of men and women deal with hair loss, and the reasons can be numerous. Ideally, before you begin to treat the problem, you’ll see a dermatologist who can help diagnose and direct your treatment protocol. Sometimes, thin hair is simply thin hair, meaning a diet change, hormonal shift, or genetics mean your hair isn’t naturally thick and full. This is nothing to be ashamed of, but there are many hair treatment options available if you want to make your hair appear thicker. True hair loss, however, usually falls into one of two camps: alopecia, which occurs when an autoimmune disorder attacks your hair follicles, causing you to lose your hair or dandruff. That’s right; hair loss can be as simple as dandruff, dry scalp, and build-up that’s causing your hair to grow more slowly or causing it to break. Further, DHT (dihydrotestosterone) is the hair growth hormone that kicks in for some women who are already genetically predisposed to hair loss. An ingredient such as ketoconazole can help to disrupt DHT, which stops the high rate of hair loss. When you’re looking for shampoo to help with hair thinning, you’ll need to identify the problem. Once you’ve done that, you can begin to determine which type of shampoo will be right for you-- and the key step is to read the ingredient list. For example, if you’ve identified dandruff and build-up as the source of your thinning hair, you’ll want to look for a shampoo with tea tree oil or other clarifying ingredients. Women, in particular, are sometimes embarrassed to use dandruff shampoo; However, it can be used daily and helps to keep your skin healthy! If your hair isn’t thinning heavily, but instead is breaking easily and appearing limp, you’ll want to look for products with lost of nourishing and moisturizing oils and vitamins. On the other hands, if your hair loss is much more serious and progressive, you’ll need to look for a stronger solution. Pura D’Or can achieve these kinds of results without using harsh chemicals or stripping your hair or head of its natural oils. Instead, the company utilizes premium organic oils and natural extracts along with bioactive formulas (bioactive simply means that the agent used will affect a living organism--i.e., your hair and scalp). Wondering which bioactive agents and organic products are used to formulate Pura D’Or products? We’ve got you covered! Pura D’Or utilizes essential oils such as argan, pumpkin, rosemary, and saw palmetto. These oils are renown for their healing and moisturizing properties. Argan oil, especially, has a strong reputation for strengthening hair strands, helping to eliminate hair breakage. To address these issues, Pura D’Or has created three different lines: the Blue line, the Gold line, and the Pro line. The Pro line is designed for hair care professionals and is only available online as a recurring order. However. the Blue and Gold lines are available widely online and in major retailers such as Walmart, Target, and CVS. You can also find it on online retailers such as Amazon. The Gold line is the most intensive hair thinning treatment available, and it is designed for people who already have noticeable thin spots on their scalp from hair loss. This intensive line includes the Advanced Therapy Shampoo and Conditioner as well as the Original Gold Label Shampoo and Conditioner. You will also find products like an all-in-one baby wash, a holding spray, and facial oils. Pura D’Or is not the only line of natural hair products available for consumers, nor is it the only line of products for thinning hair. We’re using this section to discuss some of the major competitors, and help you sift through the comparisons. Nioxin Nioxin has been one of the foremost brands in the hair thinning and rebuilding space since the 1980s. While the company is careful to not expressly call itself a hair growth line, it works by removing dandruff and sebum, as sebum contains DHT. Nioxin calls its shampoos “Cleansers” and has over eight “systems” (lines) of shampoo, conditioner, and leave in treatment combinations, depending on whether your hair is color treated, its coarseness, and how advanced your hair thinning is. One of the biggest differences between Nioxin and Pura D’Or is how deep Nioxin’s product line is. With thirty to fifty individual offerings specifically for thinning hair, it’s got something for just about everyone. Nioxin does not, however, focus on plant-based ingredients, and only certain treatments are sulfate-free and gluten-free. Its price point is similar to Pura D’Or, and it is as widely (if not more widely) available. 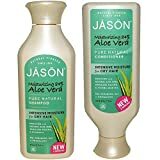 build-up, Jason does not have the same hair growth properties that Pura D’Or reviews indicate. It’s also not as widely available; you’ll likely have to find it online or in a specialty health foods store. Pura D’Or is priced in the mid-range. Online, you’ll pay somewhere between a little more than a dollar an ounce to almost two dollars an ounce. It’s not cheap, but it’s about what you’ll pay for a mid-range, high-quality shampoo line. There are larger, better options available, though you might have to search a bit to find them. Keep in mind; these products should last a long time! One of the things we love about Pura D’Or products is how widely reviewed they are. This isn’t a product that only one or two people have used and lived to tell about--thousands and thousands of people have provided Pura D’Or reviews. The other great news? The vast majority of these reviews are positive. In fact, on Amazon, the Gold label Pura D’Or reviews state that it gets returned 12% less often and has a 4.1-star rating with over ten thousand reviews. There are few products that can boast this incredible number of reviews while keeping such a strong rating! Customers have flooded the reviews section with testimonials of thicker hair and finally finding a product that works. You’ll find stories of customers buying this product for their friends and family members as well as finally feeling free to dye their hair dark or go out in public with confidence again. It’s difficult to put a price on these kinds of results, but it’s easy to tell customers are extremely grateful. It’s not often that we can so confidently recommend a product, but we’re thrilled to be able to do that here, after our Pura D’Or reviews! Pura D’Or has been able to combine natural ingredients we feel comfortable using with proven results. The thousands of reviews plus a strong showing in a clinical trial are hard to argue with. 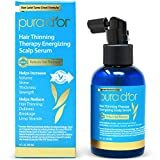 If you’re experiencing the beginning stages of hair loss or are experiencing hair thinning or balding, our final Pura D’Or reviews recommendation says to give this product a try! Pura D'Or is very reliable brand that offers various hair products with amazing and natural ingredients. It is one of the most popular hair and skincare product brands of today due to its effectiveness.